Open concept kitchens are a trend that is here to stay. There are a lot of positive things that can be said of having little to no barrier between the kitchen and the living and/or dining room. Are there any negatives to an open concept kitchen? I suppose there are a couple, but the benefits seem to outweigh any inconveniences. Here are a few pros and cons of developing an open concept kitchen in your home. Pro: The cook and clean up crew can get in on the conversation. I remember as a kid going to my grandmother’s house for holiday dinner. My grandmother would spend the first bit of the dinner prepping the food and getting ready to serve it and the last bit of the meal cleaning up and doing the dishes. Meanwhile, the majority of the rest of the family would shuffle on over to the living room and catch up on the latest family discussions. During this time, my grandmother (and whomever was helping her) could not really participate in the conversations because of that wall between the living room and the kitchen. With an open concept kitchen, there is no wall to break up the conversation. As seen in our latest kitchen renovation, we removed the wall (which would be right where I was standing when I took this photo) between the living and kitchen and put in an island. Now the kitchen is more inviting and the family can chit chat while the prep or clean up is happening. Con: Potential for less cabinet space. 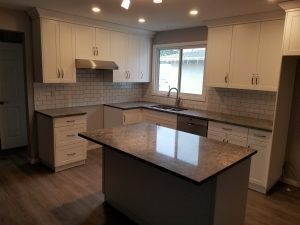 Although this kitchen didn’t have this particular problem, as there were no cabinets along the wall we removed, sometimes removing a wall can lead to a situation where you no longer have enough wall space for placing your cabinets. Sometimes having that wall means a place for a nice big pantry. Quite often though, a good design can still give you all of the storage space you need and the usual replacement for the wall, an island, often replenishes some of the storage space that is lost. Pro: Potential for more natural light. With fewer walls blocking off windows from one room to the other, there is potential for a lot more natural light. Natural light, in my humble opinion, is something in Alberta that we do not get enough of. Sure, the summer months in Edmonton are great (this year especially), but the winter can be long, dark and dreary. With more natural light coming into you home, not only does it look better inside, but you generally feel better. Con: It can cost a bit of money to open up your kitchen. When removing a wall from the middle of your house, people generally know that it will cost some money to get this done. What they often forget is that removing a wall also affects the ceiling and the flooring surrounding it. Sometimes it’s not a serious fix, but it does add extra cost to the project. Additionally, any electrical, plumbing or ventilation in the wall needs to be moved. Again, sometimes an easy fix, other times not. And finally, of course, if the wall is bearing any of the ceiling and roof load, the process of replacing the wall with a beam adds some expense. Pro: It provides a lot more functionality to your kitchen, as well as beauty. No one can argue that a new kitchen is a thing of beauty, but it’s also a thing of good function. With an open concept, it’s easier for family members to cook, clean, do their homework, build a model airplane, give the dog a haircut, or replace the brakes on your car all at the same time…together (okay, maybe not the last one). It certainly is a lot easier to work together without feeling like you are tripping over each other. Con: Sneaking cookies is much, much harder. As a professional cookie thief, I can tell you that an open concept kitchen is the bane of your existence. The thrill of swiping a couple of fresh home-baked chocolate chip cookies off of the oven and hiding around the corner while your heart thumps in your chest from fear of getting caught by your wife is now an impossible dream. Although the attempt can still be made, if caught, you wind up looking like a sad, pathetic man sitting behind the island with chocolate chips smeared on your hands and face. So, as you can see, the pros of an open concept kitchen far outweigh the cons…unless, of course, you’re a cookie thief.